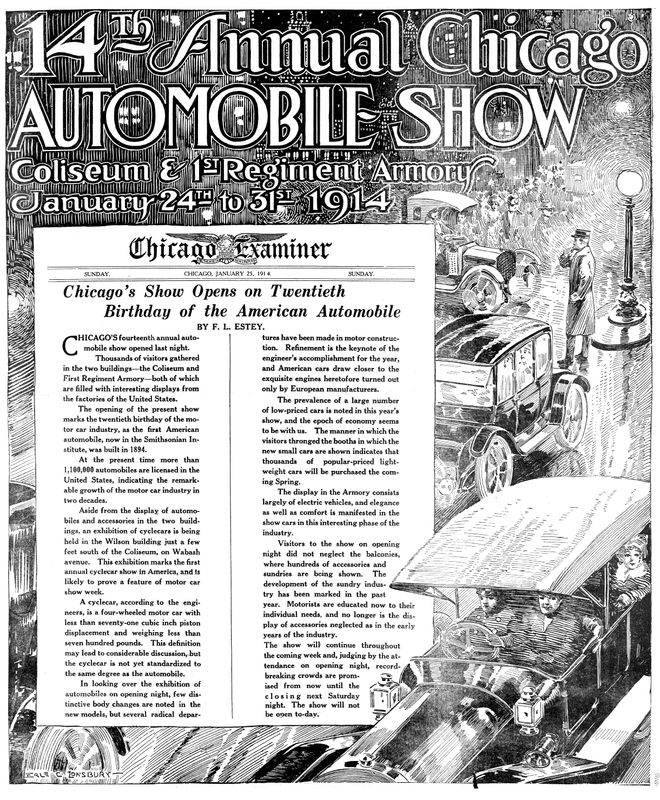 CHICAGO’S fourteenth annual automobile show opened last night. Thousands of visitors gathered in the two buildings-the Coliseum and First Regiment Armory-both of which are filled with inter;sting displays from the factories of the United States. 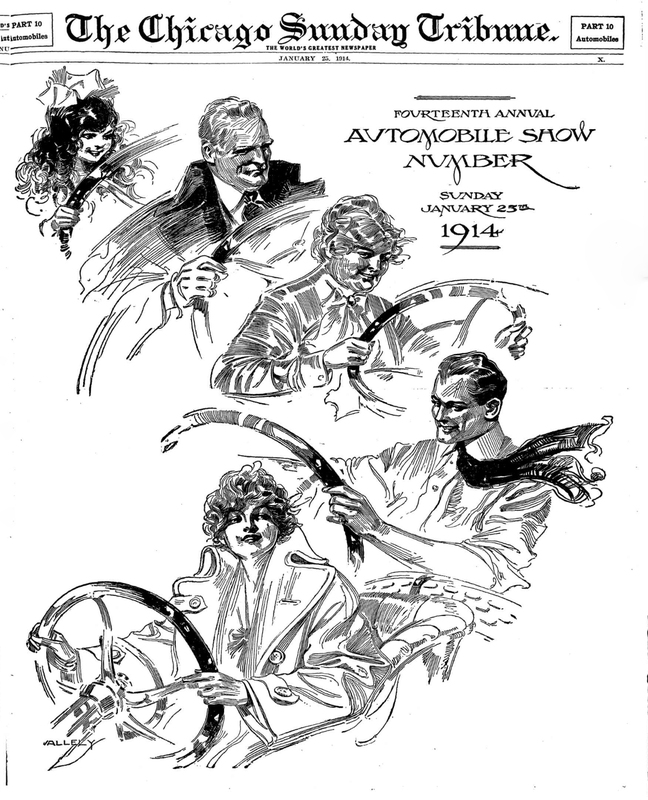 The opening of the present show marks the twentieth birthday of the motor car industry, as the first American automobile, now in the Smithsonian Institute, was built in 1894. At the present time more than 1,100,000 automobiles are licensed in the United States, indicating the remarkable growth of the motor car industry in two decades. Aside from the display of automobiles and accessories in the two buildings, an exhibition of cyclecars is being held in the Wilson building just a few feet south of the Coliseum, on Wabash avenue. This exhibition marks the first annual cyclecar show in America, and is likely to prove a feature of motor car show week. A cyclecar, according to the engineers, is a four-wheeled motor car with less than seventy-one cubic inch piston displacement and weighing less than seven hundred pounds. This definition may lead to considerable discussion, but the cyclecar is not yet standardized to the same degree as the automobile. In looking over the exhibition of automobiles on opening night, few distinctive body. changes are noted in the new models, but several radical departures have been made in motor construction. Refinement is the keynote of the engineer’s accomplishment for the year, and American cars draw closer to the exquisite engines heretofore turned out only by European manufacturers. The prevalence of a large number of low-priced cars is noted in this year’s show, and the epoch of economy seems to be with us. The manner in which the visitors thronged the booths in which the new small cars are shown indicates that thousands of popular-priced lightweight cars will be purchased the coming Spring. The display in the Armory consists largely of electric vehicles, and elegance as well as comfort is manifested in the show cars in this interesting phase of the industry. Visitors to the show on opening night did not neglect the balconies, where hundreds of accessories and sundries are being shown. The development of the sundry industry has been marked in the past year. Motorists are educated now to their individual needs, and no longer is the display of accessories neglected as in the early years of the industry. The show will continue throughout the coming week and, judging by the attendance on opening night, record-breaking crowds are promised from now until the closing next . Saturday night. The show will not be open to-day. Talk of Extravagance Growing Less as Uses Increase. Men of Moderate Means Find Time Saving Offsets Cost. You hear some misinformed people talking about the national extravagance in automobiles. Under present conditions such persons are taken just as seriously as if they advised every one to walk instead of using the railroads. Peopl6 of today need automobiles as they need railroads, and before long there will be a day when improved highways plus reasonable priced cars will make the automobile fully as important a factor in community welfare and existence as the steam propelled cars. Some Intellectual giants that have nothing better to do get to figuring out just what automobiles cost the country. They shake their heads and say that automobile extravaganza will be the downfall of this civilization just as other excesses caused the crumbling of Roman civilization. The figures are staggering until they are placed alongside of, say, railroads, for instance. Then there is an alarming shrinkage. Autos Save Cost In Time. Why, do you realize that the people paid thirteen thousand million dollars for the construction of the nation’s railroads alone, to say nothing whatever of the millions of dollars for upkeep annually? We needed them for healthy progress—they were cheap at the price. Automobiles are becoming more reasonable every year—the country needs more of them and it will get more. The right sort of an automobile is worth every cent its owner pays for it. It means health and happiness to his family and himself. and that is priceless. Automobiles make prosperous communities more prosperous, for good cars will run a hundred miles for every dollar of their purchase price. Reputable companies are making cars that earn more than their cost in time even if their owner’s time isn’t worth more than $3 a day. With a small car a man of moderate means can live in the country in the summer, come in to work daily, and give his wife and children the many benefits of living in the pure air, away from the sultry, stuffy city, and still be near his headquarters. For Instance, his man can take the children out for a spin; he can take the children to and from school—do a hundred and one errands in half the time one could do them on foot or by using the street cars. Present day motor car production is down to such a science that great quantities of cars can be produced and built pertect. Because of these great quantity producing methods small cars can be sold more reasonably than ever before, the companies depending on the immense volume for their profits.